About: Al Gamea is a non-profit organization in metro Detroit that works to provide social and health resources for the Middle Eastern LGBTQ community. Scope: Al Gamea wants their website to be updated, both in style, layout, and content. I reviewed websites of other NGOs to understand what their layouts typically were, what content they had and where, as well as what kind of tone their website conveyed. This influenced the information architecture of the site, as well as the overall style. 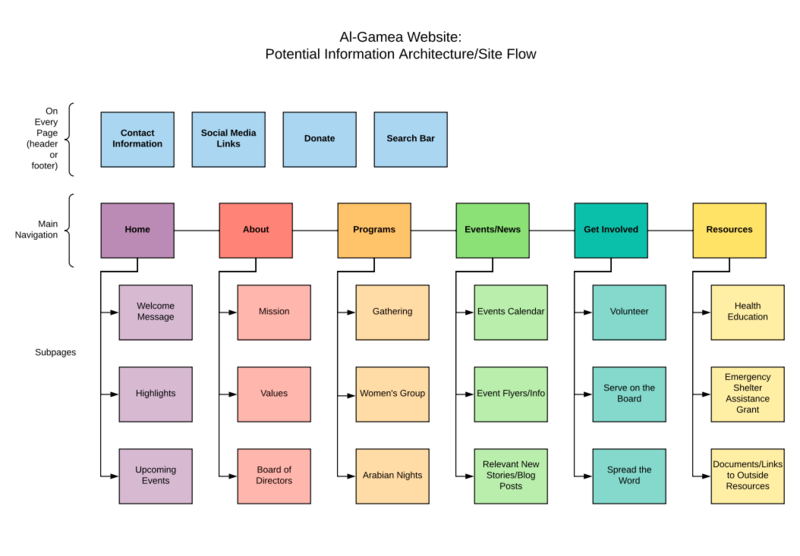 An updated information architecture scheme was proposed to help users navigate through the site more easily. This was primarily influenced by what content the organization wanted in the site, as well as what other NGO sites typically contained. I created mockups of the site with the new information architecture to get further feedback from the organization and convey how the final designs could potentially look.